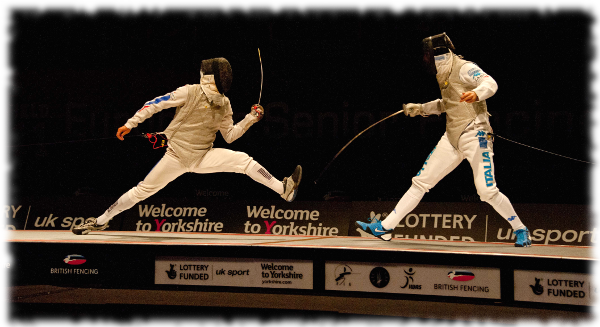 Fencing bouts take place on a piste. This is a word taken from the French, like most of the words used in fencing in this country. The Russians name means ‘the battle ground’. I leave it for you to decide which you prefer. When training either individually or in a group it isn’t necessary to have a full 14m piste for each pair. Initial training can be conducted while stationary and in the early stages of introducing movement 6m is quite sufficient. This piste has the same dimensions as that shown in the diagram. Note the broad on-guard lines which are 4m apart, the rest of the 14m piste extends outside the frame of the image. In the foreground is the Referee, beyond the piste is a table with the scoring apparatus, a red light is showing that the fencers in the right has just landed an on-target hit on the opponent. The piste is made of metal to conduct electricity, enabling the scoring system to detect and disregard floor hits. If you step off the piste it is immediately obvious to everyone, you fall off! It all adds to the drama for the cameras.